Here are our picks for a variety of festive events, brunches and other activities for children and families this weekend. 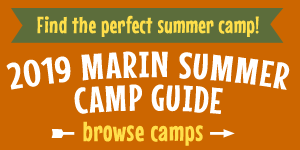 Find more events for the whole week in Marin and beyond in our Family Events Calendar. We are pleased to announce the return of Miss Kitty to the San Rafael Public Library! Miss Kitty is back for a series of fun family concerts that are just right for kids birth to 8 years old. No registration, no space limitations, all are welcome! Location: San Rafael City Hall City Council Chambers, next to the downtown Library at 1400 5th Avenue. Event details. Little Tree Studio open studio projects today will be decorating an egg using a wax kistka. Reserve your spot on their website under drop-ins. For ages 2.5–5 with adult. Location: 14 Ross Avenue, San Anselmo. For more info, call (415) 295-7037 or visit their website. Through the eyes of the greatest athletes of all time, "In Search of Greatness" is a cinematic journey into the secrets of genius. Top athletes, including Michael Jordan, Pelé, Jerry Rice and Wayne Gretzky, explore the importance of nature versus nurture in determining athletic ability. There will be complimentary beverages, snacks, and raffles throughout the duration of the evening. 100% of the proceeds from this night go back to the Friends of Stafford Lake Bike Park. Come join us for an amazing evening of inspiration and celebration! Tickets: $5. Purchase tickets here. Location: 100 Vintage Way, Novato. Event details. Join us at McInnis Park where rangers will teach tips and tricks of the trade of freshwater fishing at the park’s pond. This event requires a short walk up and down a large a hill to reach the park’s pond. All skill levels are welcome, and no experience is necessary. Dress in layers and wear sturdy shoes. Don’t forget to bring a fishing pole. A fishing license is required for participants 16 and over. Friendly dogs are welcome but must be leashed. Rain will cancel. Location: 310 Smith Ranch Road, San Rafael. Event details. Join us to clean up litter from the Corte Madera Creek watershed and restore habitat at Hal Brown Park at Creekside. All skill levels are welcome and no previous experience is necessary. All ages are welcome; anyone under the age of 18 must be accompanied by a supervising adult. Dress in layers you can get dirty, wear sturdy shoes, and bring water and a pair of gloves. Snacks will be provided. Location: Meet across from Marin General Hospital at Hal Brown Park at Creekside (at the pedestrian bridge near the bike path). Questions or to RSVP: Contact Volunteer Coordinator Kirk Schroeder at (415) 763-2977. Event details. Bring the family to the United States Coast Guard Open House for lots of free demos. Free to the public. Search and rescue demos, boat vehcile and helicopter tours, K-9 demos, games, food and drink. Location: 355 Doran Beach Road, Bodega Bay. Event details. Come out and celebrate Trips for Kids Marin! Featuring youth mountain bike skills courses, bike-themed games, and beginner trail rides. We’ll have a gear raffle, snacks, refreshments, and fun for all ages. Bring your friends and family for a great time in one of our beloved local parks. Free, but donations welcome. Register here. Aquarium of the Bay will celebrate with a special beach cleanup at Aquatic Park alongside longtime partner SF Maritime National Historical Park. Event details. Celebrate Earth Day and learn about our local wildlife “Mrs. T-style.” Go for a naturalist-led hike (bilingual Spanish hike also offered). Catch and release frogs and newts using dip-nets. Meet WildCare’s live non-releasable, educational, Ambassador Animals. Explore and touch taxidermy from WildCare’s Nature Van. Do a “Nature Scavenger Hunt Challenge”. Create a wildlife-themed arts and crafts project. Bring a picnic to enjoy on the lake shore. Location: Novato Boulevard, Picnic Area #2. There is a $5 parking fee at Stafford Lake. Event details. Alcatraz Cruises is committed to maintaining the lowest possible impact on the environment. Our Earth Day Festivities highlight our sustainability efforts with interactive exhibits teaching how to make small changes that can have a positive impact on our environment. The event is free and open to the public at Pier 33 Alcatraz Landing and will include music, entertainment and fun for the entire family. Event details. This Earth Day, join hands-on habitat restoration to save Marin County’s endangered coho salmon! The event focuses on increasing the diversity of native vegetation in newly created channels along the Lagunitas Creek floodplain to create great habitat for butterflies, birds, amphibians, and fish, and features guest speakers and activities for the whole family. Snacks and drinks provided. Free. Event details. This annual celebration features jumpers for tiny tots and older kids alike. The event includes great egg hunts, games, entertainment, face-painting and crafts; as well as a petting zoo, mansion tours, gift shop, food, entertainment by Prescott clowns, tap dancing bunnies, and the celebrated appearance of the Bunny himself! Families are also able to tour the Historic 117-year-old mansion. Location: 2960 Peralta Oaks Court, Oakland. Event details. Come meet one of Fairyland's own bunny stars and spend time with Critters By The Bay's walk-around bunny characters! There will also be puppet shows, performances, arts and crafts, and more. Free after park admission. Event details. Celebrate spring with free admission for children (when accompanied by an adult) and hands-on crafts for the family. Browse the current exhibition Peace, Love, and Woodstock and enjoy a special Woodstock-inspired photo op. Plus, at 2:00 pm, meet cartoonists Ben Costa and James Parks, creators of the Junior Library Guild Selection fantasy graphic novel series Rickety Stitch and the Gelatinous Goo. Location: 2301 Hardies Lane, Santa Rosa. Event details. Every day is a reason to celebrate the earth at San Francisco Zoo & Gardens, but a special Earth Day celebration will occur April 20 through April 22 with the topic of climate change taking center stage. On Saturday, April 20, local green vendors will be on hand, and through Earth Day, April 22, stroll around the zoo to encounter globes of information on how every Zoo visitor can help save the planet, one action item at a time! Free with zoo admission. Event details. Bounce, hop and jump into the season with SRD’s annual Spring Faire. Play carnival games, get your face painted, ride the train and bounce in the jump house. Don’t forget your baskets and follow the bunny to the egg hunt. This event will go on rain or shine. $9 per child; free for adults. Location: 118 East Strawberry Drive. Event details. Bring your kids, grand kids and family for our traditional Easter Egg hunt and meet the Easter Bunny! There will be three age groups - 0-2, 3-5, 6-9. We will also have potato sack race, egg toss and 3-legged race for the kids. Dennis Hagerty will be the Master of Ceremony with San Marin High/Marin School of Arts Students assisting the Hunt and games. Kona Shave Ice truck and the Kona Mascot add to the festivities for the Easter Egg Hunt! All Saints church will be cooking up some BBQ for sale benefiting their youth group. Location: 2 San Marin Drive, Novato. Event details. GRAMMY-nominated pianist and composer Gerald Clayton hails from jazz royalty as the son of esteemed Los Angeles bassist/arranger John Clayton and nephew of alto saxophonist Jeff Clayton. An interactive Family Workshop follows this performance and is FREE to matinee ticket-holders, led by musician, educator and Orff music expert Doug Goodkin. Cost: $5, $10 and $23. Purchase tickets here. Location: 201 Franklin Street, San Francisco. Event details. Families and friends are invited to hop into Bon Air for an Easter celebration. Put on free floppy Bunny ears and pose for a complimentary framed instant photograph with the Easter Bunny in its sweetly decorated Bunny Burrow. Free balloons for all children. Merchants and restaurants will offer demos and sidewalk specials. Time for a new kitten or puppy? Woodlands Pet Food & Treats will be hosting a pet adoption fair. Look for the Bunny Burrow in front of Mollie Stone’s Market. Event details. Skating with the Easter Beagle! Celebrate Spring with Snoopy The Easter Beagle! Skating, prizes, Easter Eggs, and spring pictures with the Easter Beagle! Cost: $5 skating admission includes skate rental. Location: 1667 West Steele Lane, Santa Rosa. Event details. It is springtime and our monthly campfire program is blooming! Come have fun and learn about our parks, nature, and history. Join us in the Sonoma Barracks Courtyard for a short talk, campfire songs, and a toasty marshmallow roast! All ages welcome, free of charge. Steady rain cancels. Location: 98 E. Spain Street, Sonoma. Event details. Do you have children who love animals? Need a goat fix? Have you always wanted your own horse? Come help feed our goats, chickens, and resident superstar, Pete, the mini horse. Collect eggs, clean pens, and participate in the daily routine to care for our farm animals. Bring gloves, water bottles, and farm-appropriate shoes. All ages welcome. Heavy rain cancels. Registration is required. Free. Parking $7 or free for Regional Parks members. Location: 5869 Cannon Lane, Petaluma. Event details. The Clubhouse at Peacock Gap is pleased to continue the tradition of Easter Brunch for your family and friends. Relax and let our talented Chef and attentive staff take care of everything while your children enjoy a visit from the Easter Bunny (11 am to 1 pm) and a free Easter Egg Hunt (11 am) on the lawn. The egg hunt starts promptly at 11 am. Easter brunch takes place at the club's Range Cafe from 10 am to 2 pm. Location: 333 Biscayne Drive, San Rafael. Event details. Created for the young and young at heart and presented by Presto! Opera, this performance includes music, dance, storytelling and prayer about Easter. This event is free and all are welcome. Kids can join our Children’s Chorus and be part of the show. Free for all. Location: 1100 California Street, San Francisco. Event details.